Henk Veen at his farewell at FC Barcelona | Marbella Marbella – Adelante! 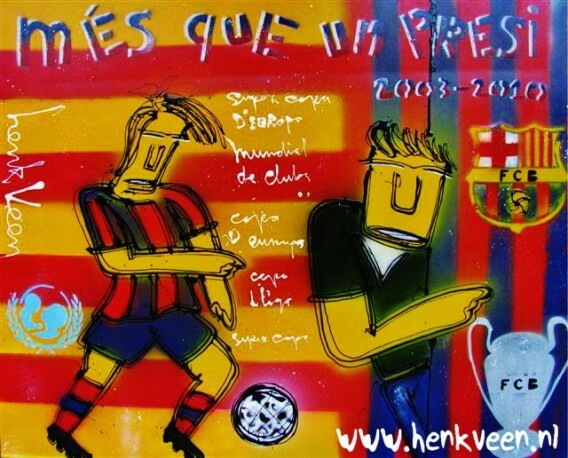 On special request Henk Veen made a gift at Joan Laporte’s farewell at FC Barcelona. 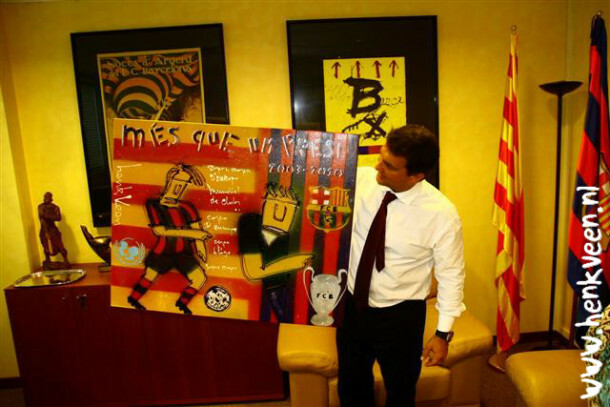 Laporte was president of the worldwide known football club FC Barcelona. On June 30, 2010 he took leave of his beloved club. He made it a really big club. He was succeeded by Sandro Rosell. Henk Veen made a painting entitled “Mes Que Un Presi” (more than a president) with the colors of FC Barcelona, Laporte himself, the European Cup, all the awards he won and the logo of UNICEF, the sponsor that he brought in. A personal painting and a beautiful souvenir of his time at the club, presented by Monique Olgers of Authentic Clubwear. Suprised he took the painting with great enthusiasm. It will always remind him of a good time at his football club.